We send out Rainbows-of-Peridots-and-Gladioli to Bill Yoakum who celebrates his special day this week. And, since the birthstone for September is the sapphire and the flower is the aster, we send out Rainbows-of-Sapphires-and-Asters to Scott Kelso who also celebrates a special day this week. Happy birthday to both of you! Karen’s Commentary: Thanks to John Klink for sending over a coffee can full of used stamps. The eagles in Big Bear love you, John! In case you don’t know, I send the stamps to a gardening club in Phelan that sells them to a company that sells packets of stamps to collectors all over the world. The gardening club donates their proceeds to help save the eagles in Big Bear. To donate used stamps, cut or tear them off your mail (leaving a ¼” border all around, if possible) and drop them off at our community center or my house, or give them to Dar or Ted. Or you can just pack up the whole envelopes and I’ll do the cutting! Darlene’s Commentary: I always love feedback from our readers! Yesterday I received a sweet card in the mail from a reader named Molly Vermette wishing me a speedy recovery and saying some very nice things about our column. Thank you, Molly, for a sunshine day for me! I also want to thank Judy Taylor, Sandi Arismendi and Karen for the beautiful custom-made cards – oh, so very cheerful! Today’s mail brought a lovely card from Almut Fleck, and I’m with you, Almut – it’s good to take your time. And I would love to know the name of the gorgeous purple flowers gracing the front of the sweet card sent by Donna Parsons! 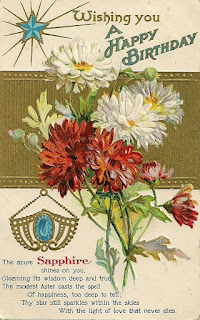 It read “Imagine a garden filled with wonderful flowers, where each one is a wish for more joy-filled hours.” Beautiful cards, beautiful poetry and the dearest friends on this Earth! I am immersed in gratitude! 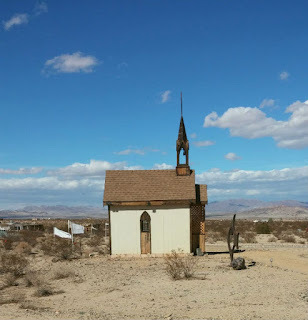 If you have not yet visited the little tiny Wayside Chapel on the property of the Glass Outhouse Art Gallery, you are missing something special. It is so darling and beautiful inside – just a precious little treasure. I take everyone there to show them, and haven’t had a disappointed visitor yet! It is open 24/7 and is a self-tour thing. The chapel is out toward the highway at 77575 29 Palms Highway and there is a nice big area to park next to it. Handy Hint: Buy a small [spray] bottle and fill it with vegetable or olive oil. It’s cheaper than buying cans of cooking spray. Thought for Today: Education will never become as expensive as ignorance.